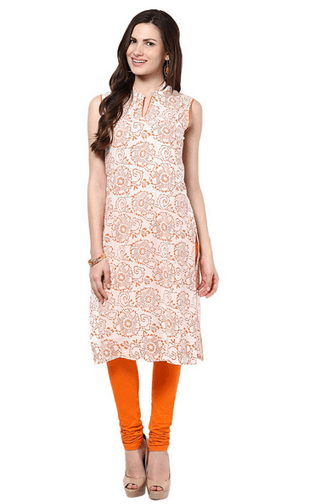 Brighten up your day with this amazing orange kurti! We love the mix of prints and the colours are SO vibrant. Great for everyday wear, and to brighten up not just your outfit but your mood too! Price: 499. Buy it here. 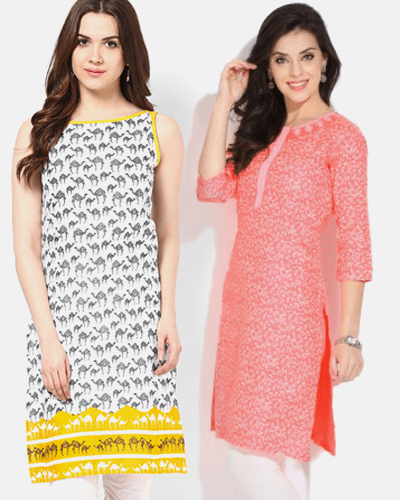 Free your arms in this printed sleeveless kurti. It’s perfect for those hot summer days and you can make it work for any occasion - casual or dressy! Price: Rs 499. Buy it here. 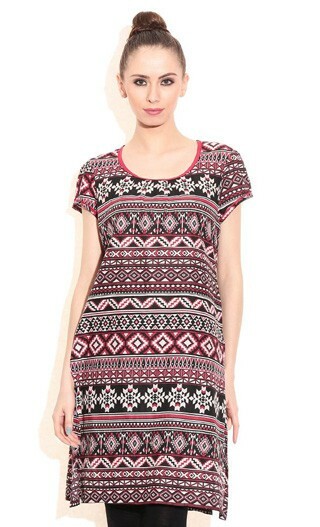 The cutest print we’ve ever seen on a kurti! We ADORE the quirky camel print. Let your creative side show when you wear this one! Trust us, everyone’s going to want to know where you picked this one up. Price: Rs 499. Buy it here. Lace isn’t only for dresses! 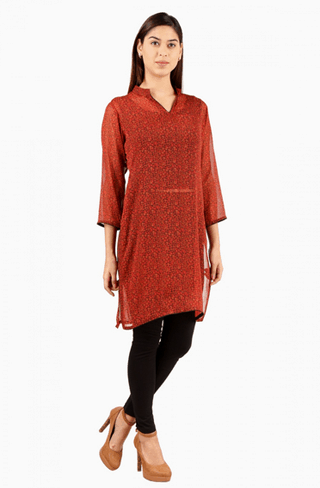 The delicate lace sleeves of this kurti totally make this one a must-have for us. Bonus - colour-blocking! Price: Rs 499. Buy it here. 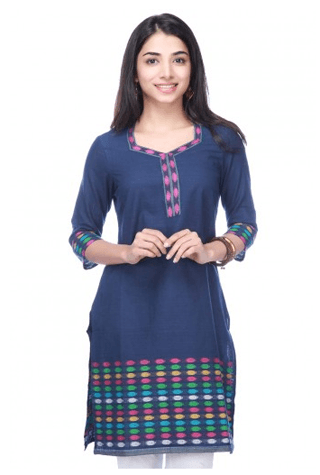 Give off easygoing vibes in this blue kurti some colourful accents. We love its simplicity, and isnt it just perfect for work? Price: Rs 419. Buy it here. The one combination that you just can’t go wrong with! This black and beige kurti is definitely one of our favourites. AND it can easily be dressed up with accessories. Price: Rs 489. Buy it here. A great take on the same old black-and-white kurti - we love the fusion essence of this one. It’s a must-have to turn heads without having to make much of an effort! Price: 487. Buy it here. This one just has everything we love - amazing mix of prints and awesome brights colours! You can wear it with jeans or leggings, or even Patiala salwars! What’s not to love?! Price: 499. Buy it here. 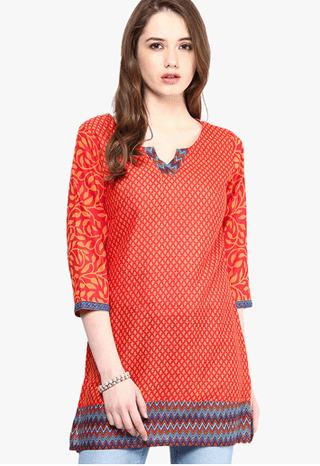 Whenever you’re have a bad day, this bright kurti is sure to cheer you up! Also the candy colour of the fabric is to die for! Price: Rs 384. Buy it here. 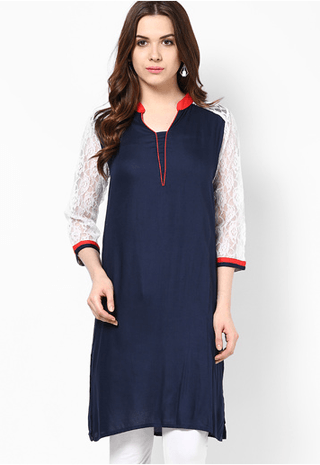 The kurti with a twist! We’re totally crushing on this peach number and this is why - the absolutely gorgeous (and so different!) floral print! So subtle and elegant, and SO pretty! Price: Rs 499. Buy it here. While cotton may be the best option for comfort, nothing drapes quite as well as a chiffon! This one is your best bet for when you want to look a bit fancy. Price: Rs 399. Buy it here. Forget boring, dull greens, and make room for this bright number! The pink embroidery on the front is super-cute, and isn’t the colour combination just adorable? Price: Rs 429. Buy it here. MUST-READ: 8 Kurta Mistakes You Are Probably Making Right Now!